Visually spectacular, intensely action-packed and powerfully prophetic since its debut, Blade Runner returns in Ridley Scott's definitive Final Cut, including extended scenes and never-before-seen special effects, now seen in sepcatacular hi-definition! In a signature role as 21st- century detective Rick Deckard, Harrison Ford brings his masculine-yet- vulnerable presence to this stylish noir thriller. In a future of high- tech possibility soured by urban and social decay, Deckard hunts for fugitive, muderous replicants - and is drawn to a mystery woman whose secrets may undermine his soul. This spectacular 5-Disc Set features all of the content of the standard definition Ultimate Collector's Edition. All five version of the legendary Sci-Fi film from Director Ridley Scott with all new 5.1 audio - the definitive Final Cut, three additional versions of the film, and the rare Work Print version - in addition to the in-depth feature length documentary "Dangerous Days", and one complete disc of bonus content including over 80-minutes of never- before-seen deleted scenes. 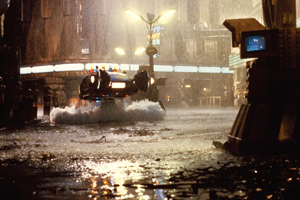 In celebration of Blade Runner's 25th anniversary, director Ridley Scott has gone back into post production to create the long-awaited definitive new version. Blade Runner: The Final Cut, spectacularly restored and remastered from original elements and scanned at 4K resolution, will contain never-before-seen added/extended scenes, added lines, new and improved special effects, director and filmmaker commentary, an all-new 5.1 Dolby® Digital audio track and more. 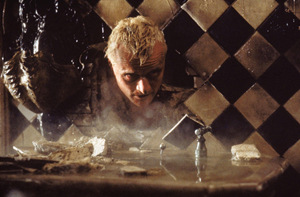 Harrison Ford, Rutger Hauer, Edward James Olmos, Joanna Cassidy, Sean Young, and Daryl Hannah are among some 80 stars, filmmakers and others who participate in the extensive bonus features. Among the bonus material highlights is Dangerous Days, a brand new, three-and-a-half-hour documentary by award-winning DVD producer Charles de Lauzirika, with an extensive look into every aspect of the film: its literary genesis, its challenging production and its controversial legacy. The definitive documentary to accompany the definitive film version.